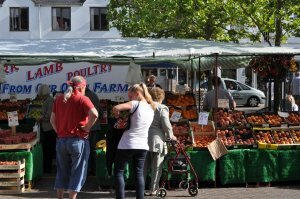 Hot food to cool shades - could you be a Wisbech Market Trader? 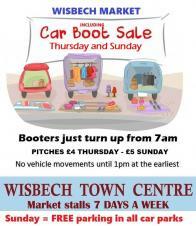 Wisbech Town Council is always looking to develop its market offer and welcomes enquiries from established or new traders with goods and services to enhance or improve the service to customers. Trading takes place every every day of the week. We have some excellent, established, well-respected traders on site and are always pleased to offer start-up concessions for new traders. Please information and application form below. To discuss your requirements, please contact the Town Council. Wisbech Market Place hosts a traditional market, operated by Wisbech Town Council, every day of the week. SHOPPERS - free unlimited car parking in nearby St Peter's or Somers Road car parks, plus the Horsefair car park (some charges may apply - click here for details). Wisbech Market Place is a bustling place with stalls selling a variety of produce during the week - from alstroemerias to zucchinis and including lots of fresh, local produce - from the regular to the exotic. The Market Trader Information Pack explains Wisbech Town Council's obligations and ways of working, and the rules that traders must comply with when using a market pitch. Sunday trading is £5 per stall (pitch availability is on a first-come-first-served basis). Traders have pitch priority over car booters with prior notification of wishing to trade. *If licensed you are guaranteed a pitch (barring exceptional circumstances) which you pay for whether in attendance or not. Licensed pitches can be particular days, or seasonal if required, we are happy to discuss any requirements. **Casual – due to the casual nature, this is a higher rate but you do not pay if not in attendance, and the pitch cannot be guaranteed.